ANC provincial chairperson Paul Mashatile and Gauteng Premier David Makhura. Picture: Alaister Russell. ANC hoping Thoko Didiza and company will help them retain a grip on the province’s three metros. As calm appears to have returned to some extent in townships in the troubled Tshwane metro, the ANC in Gauteng held a meeting with ward councillors at an undisclosed venue late on Wednesday. The meeting followed protests over the ANC’s nomination of former Cabinet minister Thoko Didiza as the mayoral candidate for Tshwane. 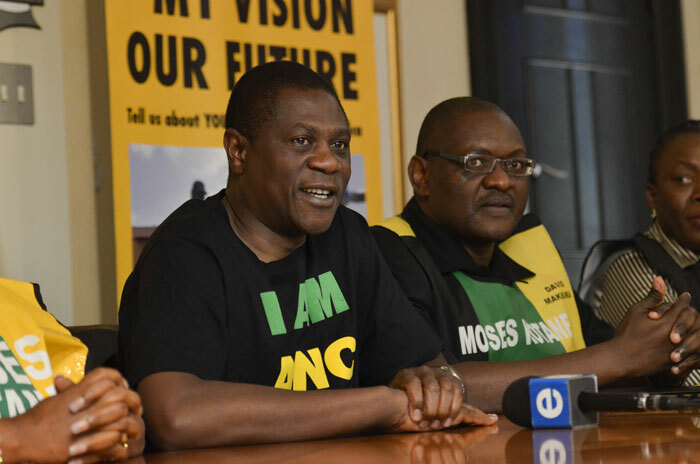 The ANC in Gauteng will hold a media briefing to introduce its provincial mayoral candidates on Thursday. Incumbent Parks Tau will again represent Johannesburg, Mzwandile Masina will be aiming to take charge in Ekurhuleni and Didiza remains the candidate for Tshwane despite the anger at the decision. There was calm in Atteridgeville when The Citizen visited the township late in the afternoon. Although there was still rubble in the streets, people were sitting outside their houses enjoying the pale winter sun. Some kids were playing soccer in the streets while some older men could be seen drinking their favourite beers. On Wednesday afternoon, the situation in Tshwane townships appeared to have calmed down immensely, although there were still pockets of isolated unrest and at least one township had to go through the night in darkness as Eskom technicians had not been allowed to fix the problem. A number of roads throughout the capital were blocked at the start of the day. eNCA reported that residents had told them that they intended to continue protesting until their demands about dropping Didiza were met. The police’s Console Tleane said they had seen “a disproportionate amount of” looting against, once again, foreign-owned shops, but he did not say if this was related to xenophobia. The police have confirmed that they have shot dead at least two looters already. Tleane also said a newly built school had also been vandalised and that a shop in Mamelodi was burnt. There was panic on Wednesday afternoon from parents picking up their children early from school in response to news that schools would be torched but authorities said that people should not react in alarm to, in particular, SMS messages purporting to be official warnings. Earlier on Wednesday morning, the only road closure was in the precinct of the Daspooort tunnel. Tleane said officials had worked to clear up rubble on the streets. He said the security cluster had doubled its efforts and would coordinate their efforts. Eskom confirmed that a 33 000-volt transformer breaker in the Mapopane East substation tripped early on Tuesday evening, plunging the protest-torn township in Tshwane into darkness. The power utility said this had impacted on a number of substations around the Tshwane township, including Vuka, Winterveld, Nonyane and Makgatho substations, affecting approximately 25 000 customers. Eskom technicians were allegedly chased away by protesting masses when they tried to respond to the troubled substation. It’s unknown if the township would be going through another night in darkness.